Men stand on an earthquake-damaged street in Kiyota, outskirts of Sapporo city, Hokkaido, northern Japan, Friday, Sept. 7, 2018. A powerful earthquake hit wide areas on Japan's northernmost main island of Hokkaido early Thursday, triggering landslides as well as causing the loss of power. 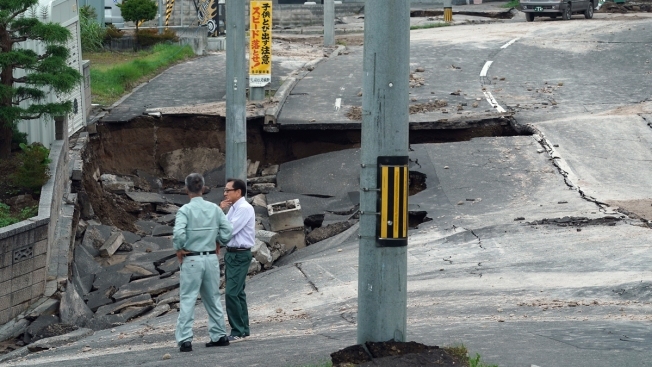 The toll from an earthquake that rocked Japan's northernmost main island of Hokkaido rose to 18 on Friday, and in one small town two dozen people remained unaccounted for after an entire mountainside collapsed on their homes. The region was slowly restoring transport links and power, with lights back in about half of the homes on the island after a day of region-wide blackouts. Officials said they hoped to have the generating capacity close to normal by the weekend, though full repairs to Hokkaido's main power plant could take up to a week.